Enjoy the scenic views of Lake Pend Oreille from this waterfront condo in the charming village of Bayview. It is conveniently located in between Coeur d’Alene and Sandpoint and about 10 minutes from Silverwood. This 2 bedroom, 1 bath condo is fully furnished and includes a laundry room with washer/dryer, towels and linens. There is a fully stocked kitchen with lots of counter space that includes a fridge, oven, microwave, coffee maker, and crock pot. You can put your dinner in the crock pot, enjoy everything the Bayview area has to offer and return to dinner ready to eat. The area is kid friendly and there is an abundance of outdoor activities to participate in: boating, fishing, hiking, biking, and swimming. 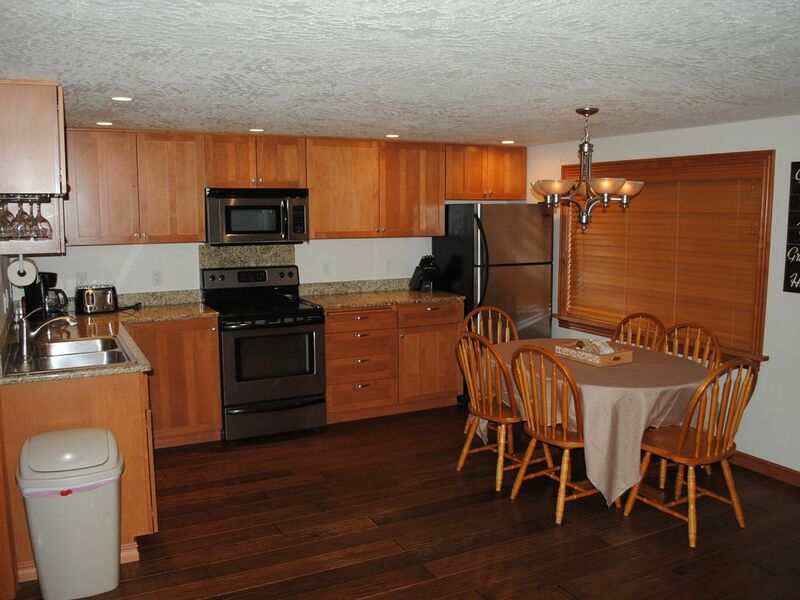 Enjoy all the conveniences of home while relaxing in a mountain atmosphere. The condo is smoke-free for your comfort. For only $110.00 a night, you can enjoy a beautiful waterfront 2 bedroom condo on the scenic Lake Pend Oreille in Bayview Idaho. Enjoy this spectacular lake or the many attractions (Silverwood, Farragut State Park, Sandpoint, Coeur d'Alene) only minutes away. My young family and I were very comfortable and Mike responded quickly to our questions. Would definitely stay again, the location offered easy access to the water and other great activities. Spacious condo, fun relaxed atmosphere, beautiful views! The condo was clean and simple. The two bedrooms and couch slept the 5 of us well. We were a bit unsure how to access the condo, but found our way around a side and wound our way in. The view was obscured by smoke from the fires, but I am sure the lake is stunning most days. While we were there, a worker put in logs to create a swimming area in the front of the condos. It makes it feel like a nice safe space to swim and play. Having close access to Silverwood Theme Park was a great bonus and the new Super 1 grocery store was so nice to purchase food. We did leave a can opener behind as we couldn't find one. We had a question about the TV and the owner was quick to respond. I believe the TV gets a few local channels, but we couldn't find out how to get them come through. There were family dvd's available and we enjoyed down time watching a few of those. If we ever come back to the area, we would stay here again! Nice upper floor apartment with nice full kitchen and all amenities. Great little waterfront swimming area for the kids. The boathouse is your view from the balcony but still very relaxing. Beds were very comfortable and very happy it had a dishwasher! Close to Silverwood and groceries. Lacking a proper a/c unit as it was 40 degrees Celsius (105f) at the time but the fans were good enough. No cable tv which I would have thought would be standard now a days. Quick reply from owner and we would recommend for sure. Thanks for the great stay. Great place on the water! Nice to be so close to Silverwood. Kids enjoyed the ducks. Portable AC didn’t do much to cool things, and it was in the 90’s, but we managed. We’d stay again. Thanks! 2nd year there and we love it, cute little town, beautiful lake, and silverwood fun and the new grocery store right down the road was a bonus this year! Condo is super nice with all the little things you need to cook and enjoy yourself, we really enjoy our stays at Bayview and try the pizza at the liquor store it's delicious and coffee at Ralph's is great and all with great service and such nice people in town. Check in is at 4:00 PM and check out is at 11:00 AM. -Due to the time it takes the cleaning company to clean, and renters not departing on time, there will be a fee of $50.00 for every 30 minutes past 11:00 AM on the departure date. Cancellation Policy: 100% refund if canceled at least 60 days before arrival date. 50% refund if canceled at least 30 days before arrival date. You must contact the owner directly to request cancellation.